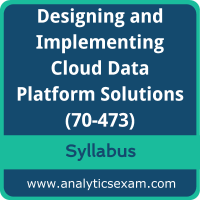 This page is a one-stop solution for any information you may require for Designing and Implementing Cloud Data Platform Solutions (70-473) Certification exam. The Microsoft 70-473 Exam Summary, Syllabus Topics, and Sample Questions provide the base for the actual MCSE - Data Management and Analytics exam preparation, we have designed these resources to help you get ready to take your dream exam. The Designing and Implementing Cloud Data Platform Solutions credential is globally recognized for validating Designing and Implementing Microsoft Azure Data Platform knowledge. With the MCSE - Data Management and Analytics Certification credential, you stand out in a crowd and prove that you have the Designing and Implementing Microsoft Azure Data Platform knowledge to make a difference within your organization. The Designing and Implementing Cloud Data Platform Solutions Certification (70-473) exam will test the candidate's knowledge on following areas. The Microsoft has created this credential to assess the knowledge and understanding of a candidate in the area as above via the certification exam. The Designing and Implementing Microsoft Azure Data Platform (70-473) Certification exam contains a high value in the market being the brand value of the Microsoft attached with it. It is highly recommended to a candidate to do a thorough study and also get a hand full of the practice to clear Designing and Implementing Cloud Data Platform Solutions exam without any hiccups.